Thanks to everyone for your well wishes through this journey. I’ve met with the contractors and am awaiting bids for a little work I want to have done on the place before I move in. And then it’s just a matter of coordinating who goes first so they’re not stumbling over each other. I won’t be moving until near the end of September, so I’m at my desk every day working on all the site service requests y’all have sent in, mainly for site audits including loyalty audits from those who have already gotten their first one done. Security and performance things change all the time. Plus, folks change out plugins and things too. So, it’s always good to get a checkup and keep your site safe and secure. Back in March or so I sent a question into Ask Yoast about whether it was safe for SEO to use the lazy load option for images. You can see his video answer that yes, it is safe. Google can still gather the info it needs about your images. FYI, I asked Yoast about the lazy load feature included in the WP Rocket plugin. But, those same nice folks also make a free, standalone LazyLoad plugin that you can use in conjunction with most any other caching plugin. Also FYI, if you run ads on your site, you need to check with the ad agency delivering them to see if you can use your own lazy load, as it might interfere with the one they provide for the ads. Lazy load can be used on videos too, if you use the iFrame code to embed them rather than the oEmbed code. See my tutorial on how to do that for both YouTube and Facebook videos. Thanks to Marilyn for letting me know that my contact forms weren’t working. Turns out that lazy load and Google recaptcha don’t play well together. An extra field gets displayed that shouldn’t be visible to humans. I have a tutorial on how to add Google reCaptcha to Contact Form 7. I’ll be updating that tutorial when I find the fix for this. I’m pretty sure it will be a way to turn off lazy load for any pages where I have reCaptcha. For now, I’ve just turned lazy load off, and I want that speed enhancement back, so researching this is at the top of my to do list. This weekend I set up a new member area on the BlogAid Learning Center for my site audit clients that are in our exclusive Facebook group. This will give me a place to put links to our Flash Challenge materials, as well as other bonus resources. And we’ll be doing the next Flash Challenge on backups soon. Speaking of Marilyn, we completed our testing of the top recipe plugins!!! And we definitely have some clear winners for you!! See my post for the top plugins with regard to the new schema markup that Google wants you to have so you can get into their Voice Search. The winner happened to be the best for speed too, and it’s one that Marilyn really liked in her comparative post that focuses on the interface and features. You’ll find a link to her post inside mine, or you can go directly there now too. Peggy Edwards is a seasoned site owner, but after selling her last site, she came to me for a full Scratch to Published training class to set up a new one, to ensure it had the proper foundation and SEO from the get go. And yep, that paid off big time!!! In just 3 months, her new site, What Things Weigh, is already showing up in Google’s Featured Snippets! Marilyn also has her recipes at the top of Google for Featured Snippets and in the Carousel. All of this tells me that the formatting I teach in the DIY SEO course works, big time, for both new and established sites. Mark your calendars now because this is going to be fun!! Michael Daniels has invited me to be a guest on his Tinkering with Tech Show on Sept 12 at 8pm ET / 6pm PT. We’ll be talking about how Gutenberg is getting WordPress ready for the way we’ll be using the internet in the very near future. And that includes where virtual and augmented reality tech is now and where it is quickly headed. We’ll be taking questions and responding to comments from viewers live too. So, mark your calendar and do join us live. The Gutenberg devs have strung out the release too long and given other devs time to try to capitalize on the negative sentiments of those who don’t want WordPress to change this way. A sophomoric reaction to Gutenberg is getting some buzz. It’s called ClassicPress and paints itself as a major fork of WordPress that will never include Gutenberg. It’s only a concept right now, and the dev behind it is trying to get enough folks to sign his petition and turn that over to the WordPress devs as evidence of how many users and community folks are against this change. Basically, the WP folks didn’t heed his negative opinions enough and he’s gathering support. Gutenberg will never be finished, just like WP in general will never be finished. It is always a work in progress. So, get on with rolling Gute into the core and let the bloody murder scream phase happen already. And then go back to work on what you were doing and let’s all continue to move into the future by either using Gute, or simply turning it off until it matures more. And stop holding up the minor and major release system with this silliness and get us past 5.0. Revolutions are bloody messes, and this will be no different. But we have to do this first phase, like it or not, to get to the bright, shiny future that awaits us. Last rumor I heard was that the Gutenberg release has now been pushed out to October. 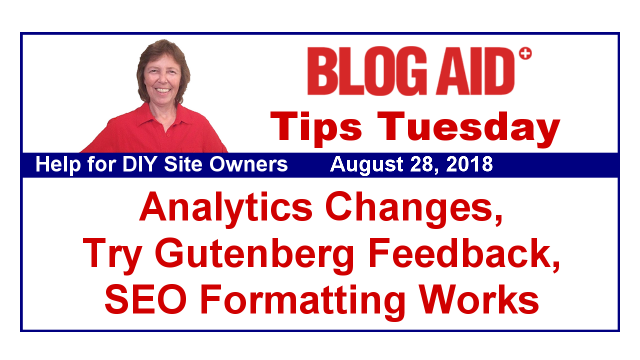 I want to read you something from the Gutenberg Times site about feedback and stats and reactions to folks who downloaded the Gutenberg plugin from the invite in WP 4.9.8. Three releases in 5 hours. Now do you see why I’m telling you to hold up on adopting Gutenberg until it matures more? I believe what Gutenberg is trying to achieve is a good thing. And making it available for more folks to try is a good thing. This is how they get mass feedback, and obviously are quickly responding to issues. I just don’t think Gutenberg is mature enough for production sites that are currently earning money. Let’s wait for the major bugs to be worked out, and more plugins to come on board, and more themes to natively support it, and then more of us will start adopting. And if you used a theme/page builder, reports are coming in that Gutenberg completely blows up the site. So, you may be one of the last to adopt it, or even need to think about abandoning your current theme. We’re at least a year away from that, I believe. So, don’t get too upset about it right now. But, if you are thinking about a new theme, or starting a new site, definitely stay away from builders of any kind. They are bloated and slow and don’t play well with other changes, like HTTPS and PHP levels and such either. That’s true whether you ever use Gute or not. They’re just a bad idea. Keep in mind that as long as there are non-techie, non-business people starting up their own websites, there will always be folks making things to meet their needs. Ask any of my site audit clients. Every one of them will tell you they wished they had found me sooner, before they got roped into all these “easy” ways that cost them time and money, and now they are having to pay more to get it all cleaned up than they would to have done it right in the first place. Get an audit and get your site square, and learn how to keep it that way and make more money. Or, panic with every new thing that changes and goofs up your site and deal with it under duress while you’re also losing money. I don’t know if this is big news or not. From what I could gather in their press release, cPanel will continue to run independently. Basically, they just got a cash infusion from the sale. cPanel is a brand of hosting control panel, which provides a nice interface for us site owners. Plesk is another brand of control panel. And guess what? Oakley Capital owns it too. That’s what has me a bit nervous. We’ll see what the future holds for us, as I’ll be keeping my eye on any changes coming down the pike. What I’m keeping my eye on right now with it involves an issue with how our SSL certificates are issued and renewed by cPanel. I don’t want to get into the details right now, but just know that I’ve been trying to get hosts, cPanel, Let’s Encrypt, and Cloudflare to listen to me about this issue that has been running for nearly a year, and none of them are listening. So, I guess we are going to have to wait for the poop to hit the fan and then maybe they will all get in a room together and address it. They don’t tend to think outside their own cubicles, and here folks like me and you are stuck trying to make them all play well together. If you see a drop, it may be because image analytics are getting split off to their own stats. I’m thinking this is a super way for image heavy sites to start tracking how folks are finding them – whether through post titles or straight up images. We don’t know how soon they will be adding this feature, so just keep it in mind if a sudden drop does hit in the near future. This kind of info is what keeps you out of panic mode with your site. So, do be sure to make a note of it somewhere, and bookmark this Tips Tuesday so you can find it again. For my site audit clients, our Facebook group is a great place to search for this kind of thing too. Same with my DIY SEO clients and our Facebook group. For folks starting a new site, there’s another big change coming down the pike. When you connect your site to Google Analytics, Google will now auto open a Google Search Console account for you too. I have no idea how they will do the setup for verifying your site there. But it is my bet that will be as far as it goes. Their auto connect feature helps them be able to send site owner emails when Google detects a problem. And lately, Google has been sending a lot of those for all manner of things. And most of those issues can only be seen in the new Search Console interface. I’m so glad I had already decided to make the first new course in the DIY SEO tutorials be on the new interface!! I’m shooting for around Halloween for the release of that. And then I’ll be following it with a basics course on the regular Search Console interface. This is an interesting article on the Tall Projects site. It started as a research project between the visit data shown in Google Analytics and the visit stats shown at WPEngine. I encourage you to read the whole article, but here are some of the top points they covered. WPEngine’s pricing is partially based on traffic. There’s a link in the article for how they count a visit, and what qualifies as one. But the big thing they do is filter out known bot agents, like Googlebot and such. For those of us on other hosts, and using AWStats, there is no such filter, which radically helps me see all the bad bots hitting your site. The gist of this research is the radical difference in visits that are shown between the host stat counter and Google Analytics. What the author surmised as the big issue is ad blockers. They can throw off Google Analytics, and massively off, he claims. For those of you who run ads from ad agencies, I’m wondering if they have included some type of script on your site that defeats ad blockers. It’s in both your best interests for them to do this, as everyone makes more money if more folks see the ads. For those of us who don’t run ads on our sites, this may all be a mute point. Thank you MaAnna for another informative Tips Tuesday. I will be sure to click and read these links as it is so important to keep up with the news. I appreciate the shoutouts and again want to thank you for the plugin project. I am definitely promoting this weeks Tips Tuesday so all my followers will get the message to visit tomight on FB Live! I SO appreciate you sharing my posts, Marilyn, and all the folks you refer for site audits and other site work too!!! You’re in my “free for life” client plan!! What are your thoughts about how Google Image data impacts search? Seems like site owners should be vigilant about optimizing their image data in order for it to be indexed properly. I think you have a course or an article about that, right? I think it’s a big deal. And will be updating my DIY SEO course to help folks ensure they are getting all the SEO they can on images. I already cover 99% of that, but there is one super important new thing we need to do. Plus, I’ll be sharing the important images folks are missing for SEO that I see in site audits all the time. I’m researching the new image SEO right now, so it’s a good time to jump in. Site audit clients get a discount link too!